Yesterday the Bavarian State Opera streamed a telecast of its new production of Rossini’s William Tell. The production team, lead by Antú Romero Nunes, was booed during their curtain calls. This was a show was best audited with the picture off. The time was moved to what could have been that of the Nazis. There were goosestepping black uniformed characters who were not wearing swastikas because that’s illegal in Germany, lots of blood, and other assorted nonsense – the typical Euro overreach. Arnold had a scar across his face that suggested he was trying to get the role of Omar in The Wire. There were lots of guns and gallons of blood. All poor Tell had was a crossbow. No wonder the Austrians ruled Switzerland for a century. The Swiss were clearly outgunned; don’t bring a crossbow to a gunfight. At the opera’s end Tell didn’t shoot Gesler with his bow, he stabbed him with an arrow. Gesler, of course, was played as a blond Aryan beast. Here’s how the audience reacted to the production teams first appearance and this is their second response. They didn’t make this much noise before, during, or after the performance. This much booing makes one think the performance was in Italy. Okay, no more on the staging. Let’s stick to the music and start with the overture. Everybody knows and loves this opera’s overture, but you had to wait until after the intermission to hear it. Even the intermission was oddly placed. It came in the third act after Tell has shot the arrow off his son’s head. Poor Jemmy (the son) had to sit onstage through out the overture as a succession of odd creatures appeared. The orchestra played the famous piece with only average success. Conductor Dan Ettinger is competent, but nothing beyond that. The overture belongs where Rossini put it and it was foolish to move it. Finally, the opera was, alas as is common, viciously cut. About 30% of it was elsewhere. This being Germany the ballet was among the casualties. These routine cuts are particularly unfortunate because William Tell is a sublime work of art. Rossini’s inspiration was at its peak. Only 37 at the time of the opera’s premiere, the composer went mute for the almost 40 years of life remaining to him. His compositional silence is one of opera’s most enduring and poignant mysteries. One of the reasons Rossini’s masterpiece is so seldom done is the fiendishly difficult tenor part – Arnold, the reluctant revolutionary. It’s not just the high notes that make the role so difficult, the tessitura is cruelly high as well. The Met has only performed the opera 31 times; the last of these was in 1931 with Giacomo Lauri-Volpi as Arnold. The Met initially did the opera in German! What were they thinking? They then switched to Italian. They never did it in its original French version. I hear rumors that the Met is thinking of doing it again; but I have no solid information about its return to New York. The only performance of the opera I attended was the 1992 San Francisco staging; this was during the Rossini bicentennial. If my memory is correct, they did the ballet. The title role was sung by the German baritone Michael Volle. The 54 year old singer made his Met debut last April as Mandryka in Strauss’s Arabella. He has a large and beefy baritone that handles his part with ease. The role contains none of the vocal challenges that face the tenor. Here’s the first act duet in which Arnold confronts the tension aroused by his love for an Austrian princess and his duty to his country (Schillers’ depiction of medieval Switzerland, in case you slept through your German literature class) while Tell appeals to his patriotism. This number is another reason that tenors avoid this part. 1st act duet. Sois immobile is the touching aria that Tell sings just before he splits the famous apple atop his son’s head. Understandably, he tells him not to move. Volle sings the short number with feeling and tenderness. The Austrian Princess, Mathilde, was played by the Latvian soprano Marina Rebeka. The young (34) artist has sung 17 times at the Met all as as Donna Anna in Don Giovanni and all of these during the 2011-12 season. 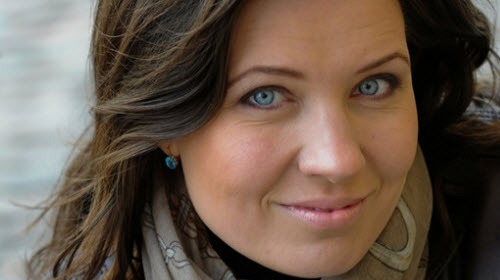 She has a well controlled and beautiful spinto soprano that should do very well in the great Verdi soprano roles. Sombre forêt, désert triste et sauvage is one of Rossini’s great creations. Berlioz must have known every note in it and obviously had in mind when he wrote the aforementioned The Trojans. 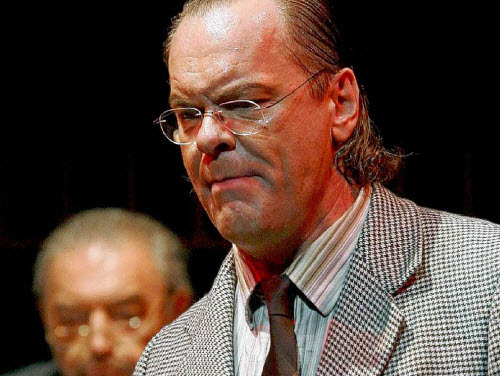 Bass Günther Groissböck was appropriately nasty as the villain Gesler and he also sang very well. 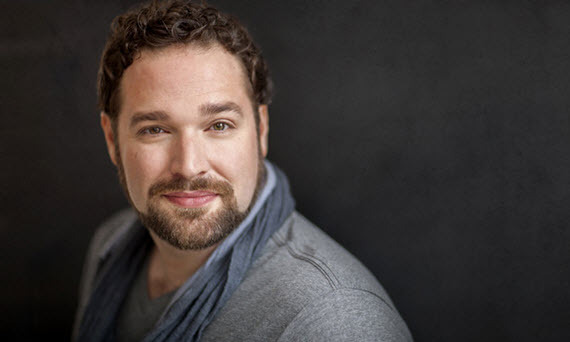 He’s singing Baron Ochs at the Salzburg Festival in August. Russian soprano Evgeniya Sotnikova is so petite that she really looked like the young boy she was portraying. Her light voice was ideal for the part. The remainder of the cast were up to the usual high standard that prevails at the Munich house. In summary, this was a very good performance of a great masterpiece as long as you didn’t have to look at it. I hope that there will be more stagings of this opera in the near future and that they will be uncut and mounted with taste. Sad!! I don’t like historic operas transplanted. However I do agree the ballet is too much. I think it goes on for 50 minutes in my version. Some operas can make delightful time transitions. Some I even prefer that way. Rossini wrote dance music for Acts 1 and 3 of Tell. Depending on the conductor and whether the music is actually being danced to, the performance time should never be more than 20 minutes – 17 is likely close to what it really is. Its at least 45 minutes. Maybe they ran the dances together. Or even imported some?? Just when one seems to end, another begins. 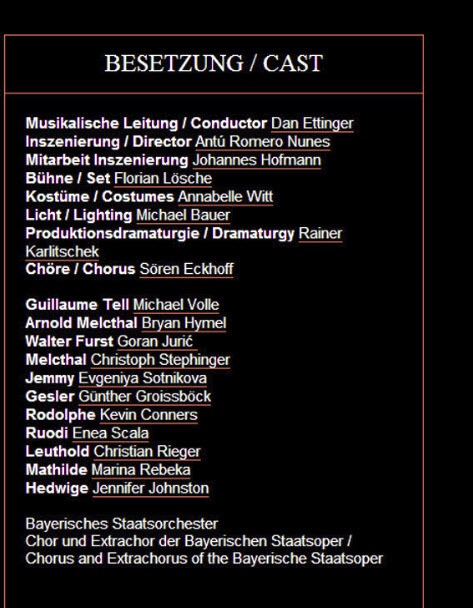 I saw this production in Munich and I agree wholly with the comments. I got a Vespri transplanted to a similar time. Awful.!! Wrecked vehicles all over and everything grey, grey, grey!! And those awful close ups. Shame to distract from Vassallo’s wonderful singing and acting.